← Homemade Laundry Detergent = Success! As part of my holiday craft to-do list, I decided to try and make ornaments/gift tags this year. Not wanting to go to the store and get any special ingredients, I was able to make a batch of salt dough and a batch of corn starch clay. I will also cheat and use this as part of my December Photo Month (DePhoMo) entry; one photo, every day. The corn starch clay was much more smooth and more pleasant to knead. It was also a nice white color. 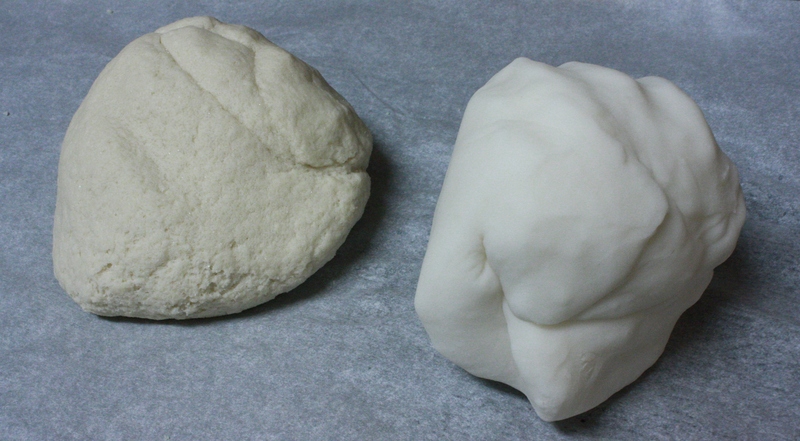 The salt dough was an off-white white color and the salt was obvious. When I first stamped the ornaments, the salt dough looked nicer – the stamp imprints more on the dough. The salt dough, for whatever reason, is taking forever to dry, even after a couple hours in the oven and 3 days on the counter. The Verdict: I think next time I will use the cornstarch clay and roll out the dough thinner. Or, I could try this Porcelain recipe from the junk wave. Thanks for the comparison. We made the salt dough, and they were great for a country look, but I love how the cornstarch have a very white clean appearance. I also didn’t like how long it took the salt dough to dry. thanks for sharing your results!!! I’ve been intrigued by the pocelain as well… there may not be enough time before Christmas to get all this crafting goodness in… then again, if i’d get off the computer and get something done…. Have you tried making cinnamon dough ornaments/gift tags? I made them every year as a teacher- I have had some for 10 years and they still smell like cinnamon. You simply take applesauce, cinnamon, and perhaps a bit of glue (depends on the recipe you use). Mix it up and roll it out. Then use cookie cutters to cut out various shapes, use a straw to punch out a whole for the sting. They look like gingerbread and smell divine. Just do a search for cinnamon applesauce ornaments. Super easy, and depending on thickness can take 1-3 days to dry (no baking). Good luck! The cinnamon ornaments were on my to-do list as well, but I wanted more of a white/off-white tag, so those will have to be saved for next year! I recently made cinnamon ornaments but was suprised and dissapointed at how much cinnamon it took to get the right consistancy. To make a small batch we had to use almost 2 cups of cinnamon! So it cost about $6 to make and it didn’t make that many. It smelled great, but I think I can get the same effct by adding cinnamon to a clay recipe. I am going to try it and I will let you know how it goes! Yes, let me know! I love the smell of cinnamon but two cups is a lot of cinnamon! So, do you heat the cornstarch and baking soda in that saucepan? It says to let it cool, but you never say that it should be on the stove and heated to any temperature. I assume you’d heat it on low maybe? Whoops- sorry I left that part out! Yes, cook it all on low heat. Thanks soo much for the comparison! I promised my children we would make ornaments today and I was not sure if we should attempt the salt-dough or the cornstarch. After reading your page I’m thinking we will try the cornstarch first, I love how smooth it looks! I mixed in some white glitter to the cornstarch clay when I kneeded it. Still nice and smooth and white with a beautiful sparkle! I love how these turned out. Thanks for the comparison! Hi, I absolutly love this craft and will be making some today! I had a quick question what temp do I hear my oven to and for how long do I bake these? I’ve seen other posts say 2 hours, does that sound about right? I think that would work. I can’t remember what I did. How did you dry the clay? Did you leave it on your counter to dry or baked it? And for how long? I left it on my counter, but it took a long time (in December, for at least a couple days) to dry. I would probably put it in the oven at low heat next time, unless I made them in the summer, they might dry faster with warmer heat. Hello the way I learned it (may explain the wetness) we used 1 cup salt, 2 cup flour and just enough of water to make it like clay (just alittle)almost perfect texture 🙂 and we added sokme of the water in the salt to help make the salt melt. Sorry for the late reply – a cup of water is 8 oz, but I am not sure the weight of other things – did you find anything with a web search? Cup measures are easily and cheaply available in UK. I invested one pound and love them. Lot less hassle than using scales etc. This is a late answer to this problem, but it might help. You can use a cup of tea or a glass, what is important is the volume…not weight, therefore just use the information of 1 cup or 2 cups just as a ratio between volumes. Hello, I have made corn dough and it just cracked apart. How can it be that it does ? Hope for answers….